Notes: The original concept for this series was first animated back in 1988 as the now universally panned single-shot OVA [b]Harbor Light Story: From Fashion Lala[/b], which has since been reviewed here at THEM Anime. This is the most recent of Studio Pierrot's magical girl anime franchises. Miho Shinohara is the precocious 9-year-old daughter of a paleontologist, and she would like nothing more than to be famous. One day, she unexpectedly comes into the possession of what she thinks are dolls, but are in fact the magical dinosaurs Pigu and Mogu, who grant her the power to create the clothes she draws upon a special drawing pad, as well as the power to become a teenage version of herself. 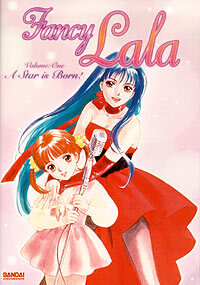 She begins to live the life of the idol, Lala - but is being famous really worth all the trouble you get into to do it? And here's a winner. Magical Stage Fancy Lala returns to the escapist formula of the original magical girl shows - give a child the magical power to live out her dreams, and show her that perhaps it's not a perfect way to live after all. But unlike a lot of the older series that focus on this, Fancy Lala is hardly saccharine or embarrassing to watch, despite the peppy, typically magical-girl opening theme. It actually has a degree of realism in its treat of the idol phenomenon, where it's not just looking pretty and performing - but the constant auditions and appointments, and having to make the "big break" to even start. The plot's pretty simple - she has to keep appointments as the idol Lala, without revealing her other identity as Miho (and vice versa), and some awkward situations arise (like talking on two phones as both personas at the same time) and despite her body becoming teenaged when she uses her magic, her mind is still very much that of a child - albeit an incredibly talented and mature one. (If only I could draw like Miho!) Add in pretty good writing, and we have a magical girl show that adults shouldn't feel embarrassed to watch in the least. Keep in mind that the idol pop music in this show is going to reflect the youth and exuberance (and inexperience) of the voice actress singing it. It's cute, it's peppy, and it's incredibly high-pitched, which may not sit well with some. But come on, she's fourteen, what do you expect? Leann Rimes? Not in Japan! It's nothing harmful, though, unless you're sensitive of hearing or something. One more fun angle I have to point out is the whole paleontology / dinosaurs issue. Pigu and Mogu are the cutest dinosaurs I've ever seen! Well, they look kinda funny for dinosaurs, but the actual paleontology bit (when Miho visits her dad's museum, for example) is rather interesting, and not badly done at all. (For the record, yes, despite Japan being largely volcanic in origin, there have been dinosaur and ichthyosaur fossils located in certain locations on the islands.) I'd like to see how Pigu and Mogu fit into this equation, though. Magical Stage Fancy Lala has a lot of the elements that make this genre fun, and though it does take itself generally seriously in parts, it's mostly an exercise of "what ifs" that's fun and surprisingly refreshing. While it's definitely a kid's show, it's one that doesn't talk down at all to any child watching this, and it has enough serious content to keep parents interested too. Show this to your kids once they're old enough to read subtitles! Recommended Audience: Just a couple of scenes with Lala in a swimsuit during a photo shoot, and that's about as far as it gets. Fine for children and their parents!